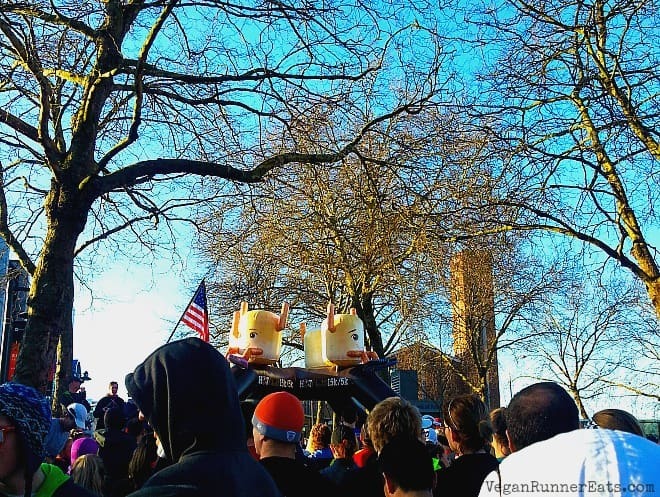 It’s been a while since the last time I participated in a running race, but last Sunday I finally put my fears and doubts aside and took part in Seattle’s Hot Chocolate 15k. Today I’ve put together a detailed race recap to show you exactly how I managed to exceed my expectations and have a successful run this past weekend. Not going to lie, it felt great to finally add another medal to my collection of race bling! As you may know from my previous posts, I’ve been in a full-on training mode for my 3rd marathon coming up this June. The marathon is also taking place in Seattle, so I knew that running last week’s 15k race would be helpful in at least two ways: it would show me what racing in Seattle felt like, and teach me what running a bigger race was all about. All of my previous races back from when we lived in Alabama were relatively small, whereas the coming up Seattle Rock’n’Roll Marathon could easily top 20 thousand participants. 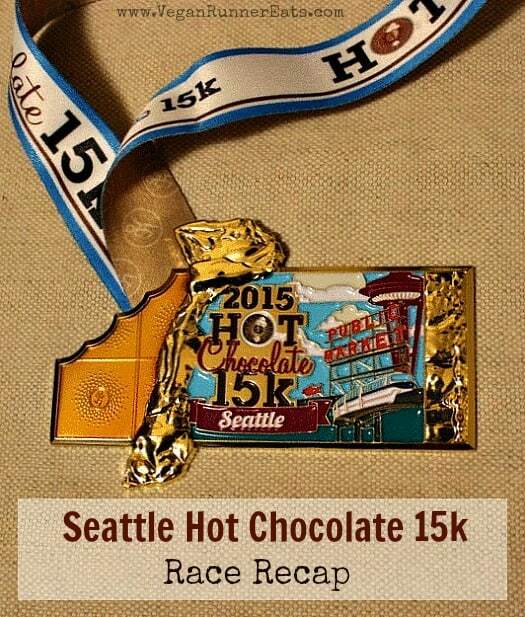 The Hot Chocolate 15k racing series happens in 15 cities all over the US over the year. I kept seeing their ads online in the past few weeks, and eventually decided to take the plunge and sign up. I’ve never raced a 15k distance before (although I’ve done 7 half marathons and 2 full marathons to date), so it was refreshing to think that no matter what time I’d clock, it would automatically be a personal record. A few days before the race I looked up the course elevation chart and realized that it had A LOT of hills! Thankfully, I’ve been doing quite a bit of hill running lately, so I knew that theoretically I should be ok. Once again, it would be a PR even if I walked the whole way, right? The 15k race was scheduled to start at 7:55 am (there was also a 5k at 6:45). I woke up at 5:30 and ate a large bowl of overnight oats with some pumpkin seeds, chopped dates, cinnamon and almond milk – I packed the dry ingredients and the milk separately at home the day before. I also drank a cup of green tea. – The fact that I was wearing dress socks and didn’t know how they would behave: I had packed two left socks at home by mistake (the Injinji 5-finger ones that I always wear on long runs). Since my favorite socks weren’t an option, I had to resort to the only other clean pair of socks that I had – regular black dress socks. – The fact that those upcoming hills were loooong! When I signed up for the race, I was prompted to enter my estimated average race pace. I entered 8:40 even though I haven’t run that pace in a long time, except for the treadmill interval workouts. This added another reason for my stress: I didn’t want to disappoint myself, but I knew that this pace would be tough to maintain, especially on hills. One thing I always forget: somehow I have this dormant extra gear that kicks in only during races, and so far it never disappointed me. I was set to find out if it was going to help me once again. So on we went just before 8 am. The morning was bright and crisp, and I quickly realized that my jacket was going to be fine. The hills started right away, but thankfully with downhills in the first mile or so. I kept telling myself to slow down to save energy, so the first mile went by in 8:58. Then the uphills started. I still felt pretty fresh, so they didn’t bother me much. I wasn’t trying to pass anybody going uphill, but still passed a few people. We ran through a tunnel for at least a quarter mile, and came out onto Aurora Avenue – a very long street that must be running up all the way to Canada (or so it seems). Thankfully, we didn’t have to run that far :). As nice and scenic as Aurora Avenue is, passing by Lake Union and turning into George Washington Memorial Bridge (a.k.a. Aurora Avenue Bridge), it’s also almost a complete uphill situation – or downhill, depending on your direction. The fourth mile of the race took me 8:42 to run – surprisingly faster than I expected to do on almost an entirely uphill stretch of road. That hidden gear was working fine, even allowing me to pass people going up. Crossing the George Washington Memorial Bridge yielded some incredible views of the entire city, with the snow-capped Olympic Mountains to the left and the Cascades to the right. It seemed like the whole city had stopped just for us, the 5000+ participants of this race. I would have loved to stop and take a picture but decided against it for the sake of my race pace. Once the bridge was crossed, the uphill battle started again. Almost the entire mile 6 was a straight ascent, during which I was mentally begging the people running in the opposite direction (those who were ahead of me) to tell me how much longer we had to go up. And still I managed to pass more people than be passed by others! Mile 6 went by in 8:43. Once I reached mile 7 and realized that there was only 2.3 miles to go, things started looking up. The George Washington Bridge went uphill going south, but I still managed to cross it and pass the mile 8 marker within 8:20. Mile 8 was run in 8:27. I ate an energy gel about 1.5 miles before the end to avoid fading, and stopped to take a picture above. Okay, my cell phone camera may not have captured the majestic view of thousands of people running up and down the Aurora Avenue with a backdrop of downtown Seattle, but at least I tried. By the time mile 9 started, I gathered all of the energy I had left and decided to give it my best shot. I was begging for no more uphills, but they continued all the way till the last tenth of a mile. I probably looked really miserable going up those hills trying to maintain the speed, but thankfully it was all for the best. I surprised myself with clocking 8:06 for the last mile – faster than any of the miles during the entire race! 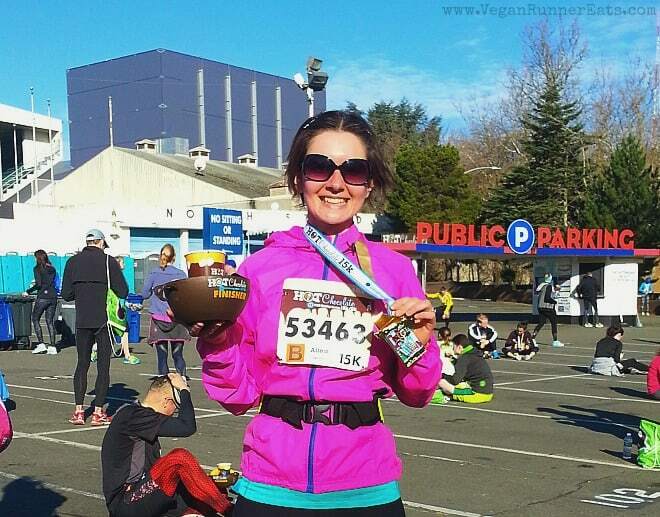 Another awesome thing that happened – I met a couple readers of Vegan Runner Eats! Lesley and Matt from Olympia had messaged me a few days earlier after having read in this post that I would be doing a 15k in Seattle on March 1st. They were running this race too (Lesley – the 5k, Matt – the 15k), so we agreed to meet after the race for a chat. They turned out to be a lovely couple exploring the world of running, hiking and being vegetarian. It was so nice to hear that they’ve discovered a few vegan places in Seattle thanks to my blog, in particular the Flying Apron Vegan Bakery and Wayward Vegan Cafe. I found out from them that the latter had just moved to a new location, so Rob and I knew where we were going for lunch later that day. 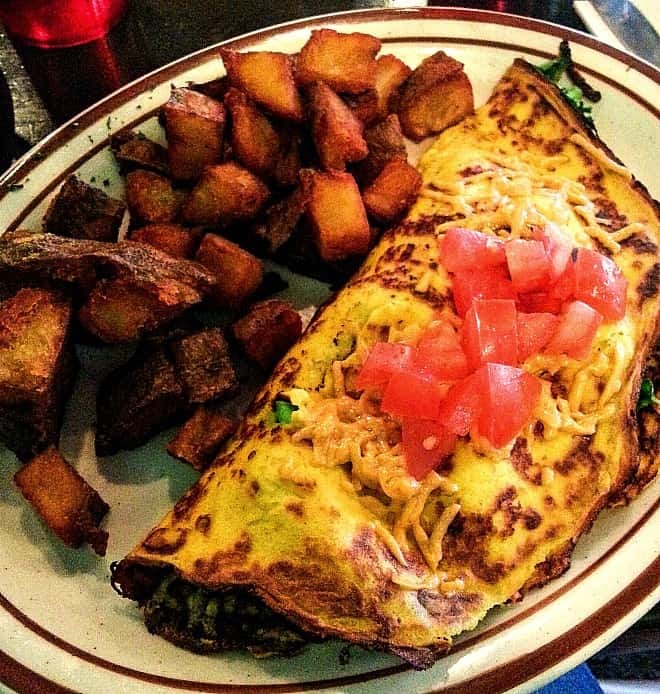 My Very Veggie omelet with a side of home fries at Wayward Vegan Cafe was just what I needed after the race! If you find yourself in Seattle craving some vegan comfort food, I highly recommend this place. So, what’s next in store for me running-wise? 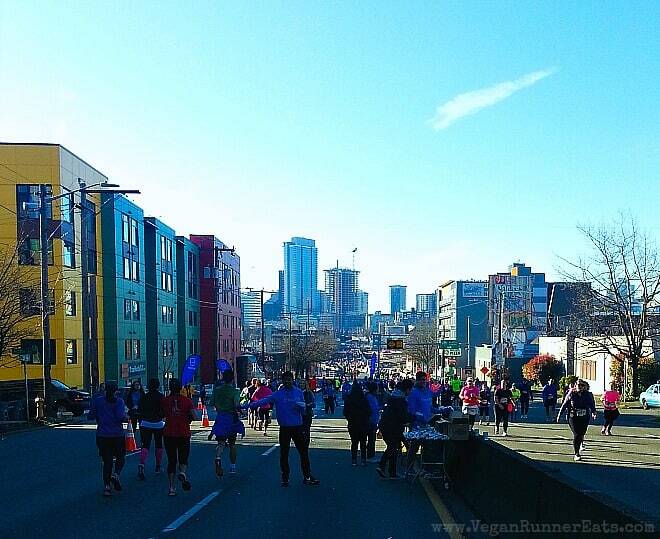 Gradually upping the mileage as I train for the upcoming Rock’n’Roll Seattle Marathon on June 13th, and posting monthly updates about my training along with writing about one of my favorite subjects – vegan food! Question for you: Have you participated in any running races since the beginning of this year? Please share below! If you’ve enjoyed today’s post, please share it with your friends! And let’s stay in touch – you can follow Vegan Runner Eats by subscribing in the top right corner of this post, or by following the blog on Facebook, Twitter, Google+ and Instagram! 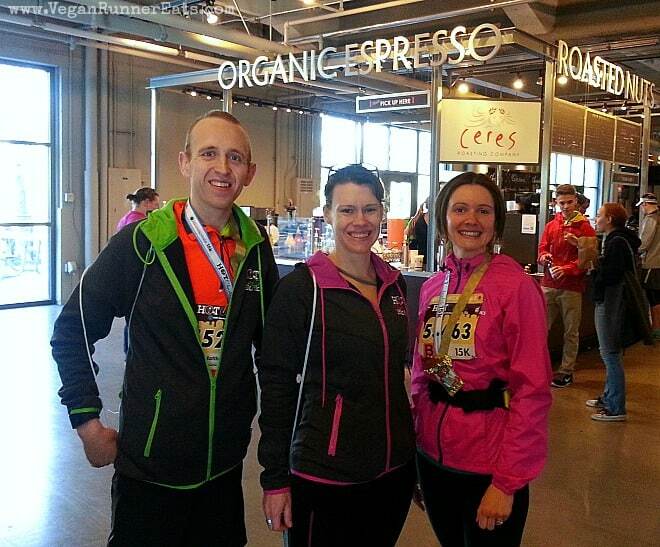 Tagged Hot Chocolate 15k, race recap, running, Seattle. Bookmark the permalink. I just discovered your page looking for information on plant-based runners. I’ve been WF-PB since June of 2011 and I’ve been running since April of 2013, having packed in many 5ks, two 10ks and am currently training for my first half marathon. I’ve been distressed recently wondering if I’m eating enough and how to fuel and refuel so I’m happy to have found your site. Reading info from No Meat Athlete and other PB runners’ books is great, but seeing it from a local, real-life perspective is great! Good luck to you at the Rock & Roll! Thank you Jan-Marie! I’ll definitely be posting more updates on nutrition as my training for the marathon progresses. Thank you for stopping by, and good luck in your upcoming half marathon! I'm also thinking of starting a No Meat Athlete running group down here in Pierce County. Welcome to Seattle, by the way! Thanks for the restaurant suggestion! Will check them out. So, I have to ask – was the chocolate fondue vegan? Supposedly so, Becky. The race officials told me that it was dairy-free. Congratulations on running a good race, and having fun! My husband and I belong to a local running club that has races about once a month. This sunday’s race is a 10 mile hilly one up to our favoriet local lake, Lake Ilsanjo in Annadel State Park. It’s a trail run and just beautiful. We are both vegan, so we tend to having a big bowl of oatmeal before a race, and usally banana’s or similar afterwards. We also do Orienteering, which involves running but also map reading. Basically we just love being outdoors! 🙂 Have fun in your next race! Your 10-miler sounds like a beautiful race, Heidi! I know you told me that you used to run trails when you lived here on Whidbey Island. I’ve been thinking that I should check that out too soon, especially before my current outside running route gets old. Well done! Me and hubby ran our first half last autumn (rather hilly!) and entering a 10k this May. Thanks for sharing your feelings here- good to know an experienced runner like you still gets nervous! I ate chia pudding for breakfast the morning of our half. Good luck in your upcoming 10k, Sarojini! I’ve been wanting to try making chia pudding, but so far I’ve only been adding it to my smoothies and oatmeal. What else do you put in it besides chia seeds?